(Wenham MA) The points were flowing. The defense? Not so much in the second half. But when you build up a 36-point lead, some unpleasing defense in a second half isn’t fatal. 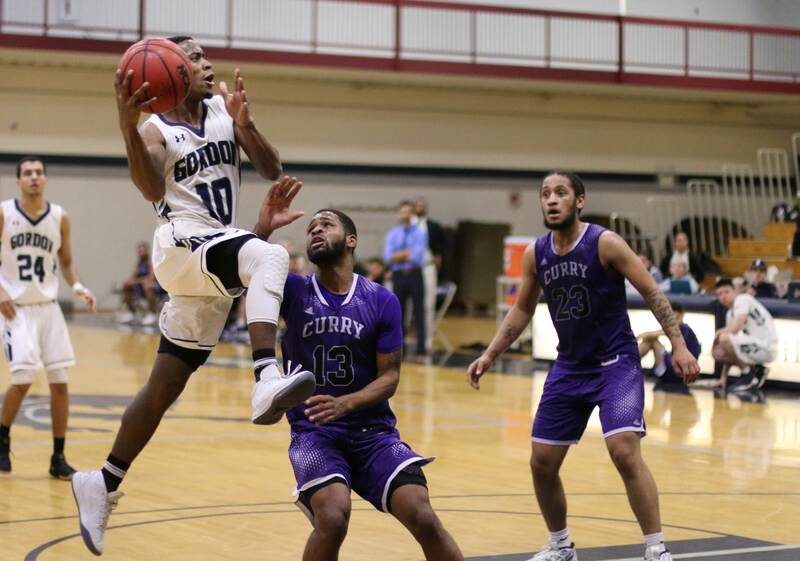 Gordon downed Curry, 105-89, on Saturday afternoon in a Commonwealth Coast Conference game at the Bennett Center. The Scots (5-1) have now won four straight. 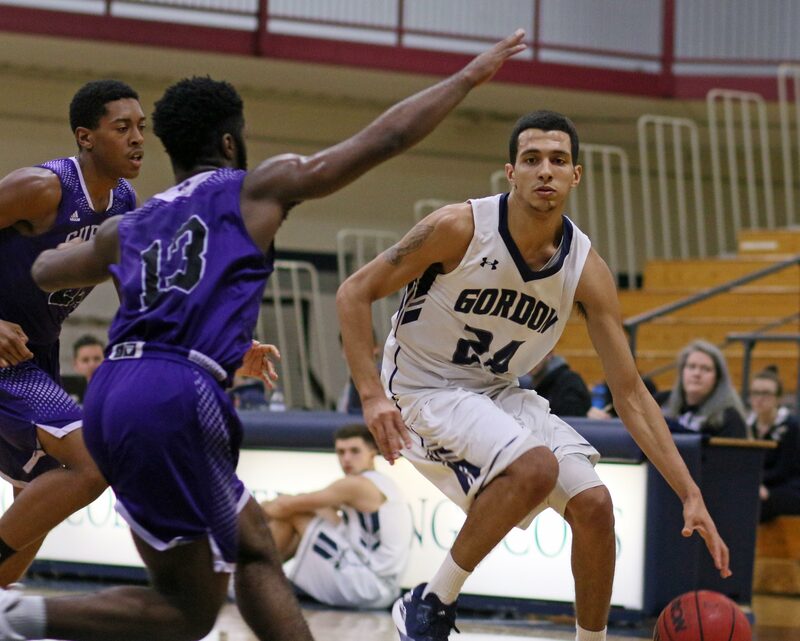 Ahead for GC are three home games (Western New England, Colby, and Johnson & Wales) in the next seven days. 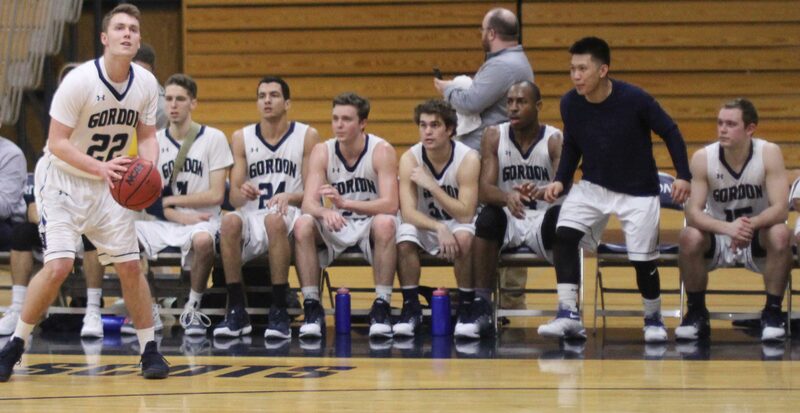 The big difference in this season’s Gordon team is their commitment to playing zone defense. The Scots did give up a ton of points but most of them came after GC had a 72-36 advantage with 12:41 remaining. The Gordon reserves finished the game and during that segment the Colonels (0-7) went nuts from long range and had a 53-point final 12:41. 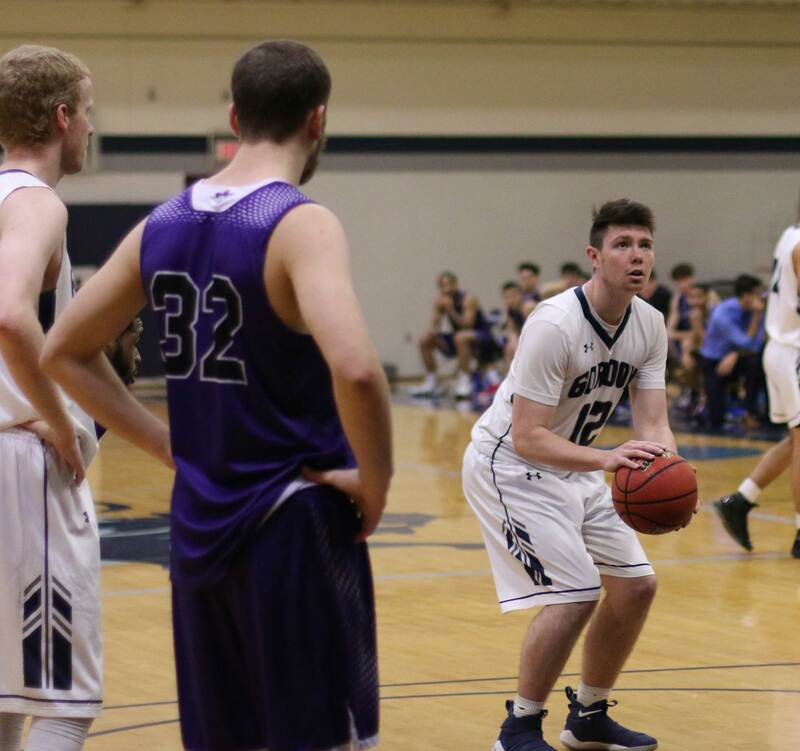 “The idea of the zone defense is not only to keep our best players in the game but also to prevent/defend the three-point shot,” said Coach Murphy. Obviously, the 53 points, many coming from downtown, didn’t settle well with the coach. But the bigger picture was that when the starters played, the visitors struggled mightily. The Scots were up, 10-0, after three minutes and, 25-3, after eight minutes. The lead at halftime was, 52-24. There were few defensive issues that I could see. Curry’s sixty-five points in the second half is a nice change for them. How blessed we are to regularly have competitive teams! How would you handle these numbers? Curry is 2-80 over the last 3+ seasons. They have now lost 55 consecutive Commonwealth Coast Conference games. 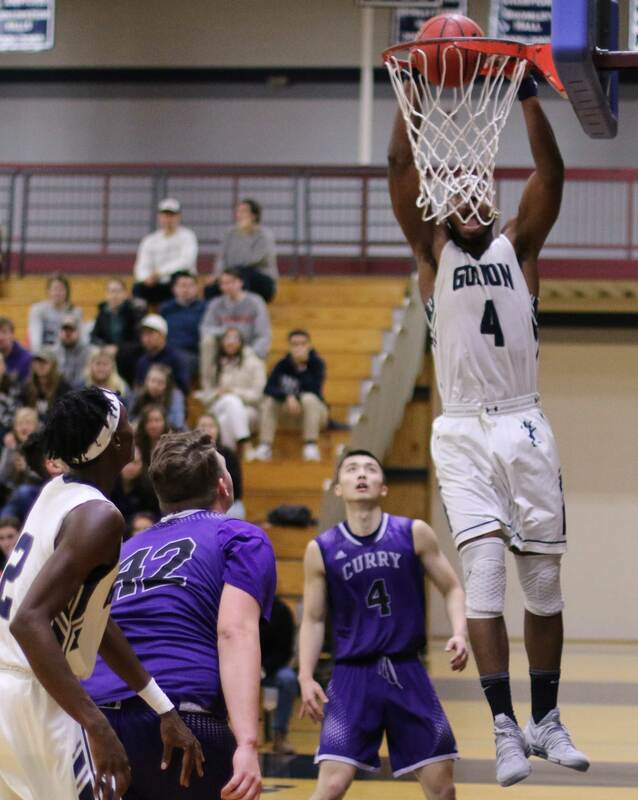 Last win in the CCC was against Salve Regina in February of 2015. The Colonels have now lost thirty straight games. That is why is was good to see them happy/excited over their team’s second half performance. All the Scots in uniform played and everyone scored. 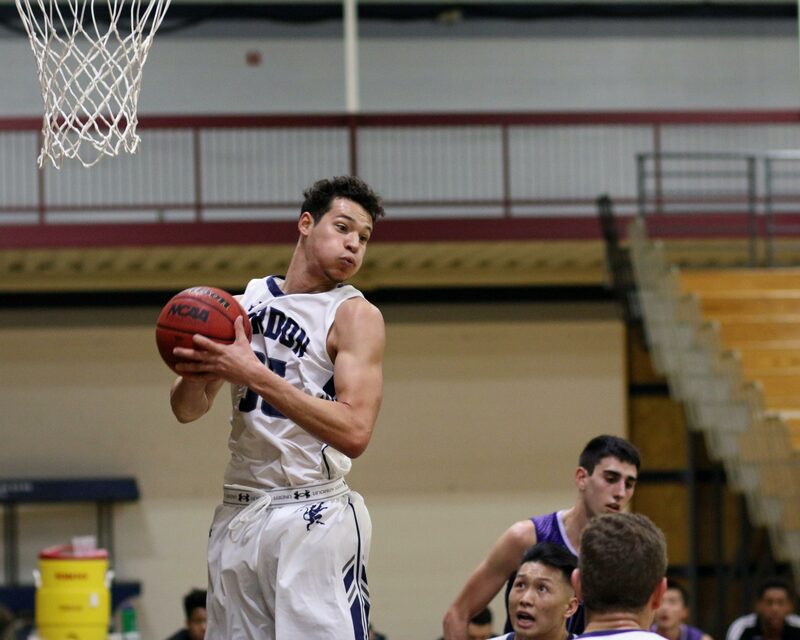 Junior AJ Terry is an exciting player to watch. His hustle is noticeable. He made a great save of a ball going out-of-bounds that set up an Eric Demers’ triple. AJ set a career high in points (12). Gordon figured out early on that they could get to the basket for high-percentage shots. They ended up with forty-eight points in the paint. That’s smart basketball. 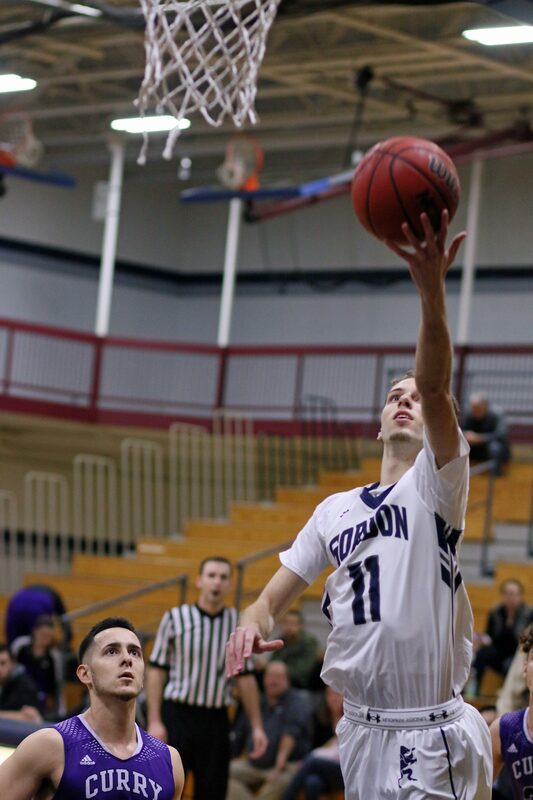 Eric Demers was the leading scorer with nineteen points in limited playing time. Today’s points give the GC junior (1168) which moved him past Jered Stewart and Andrew Ellrod into 14th on the Gordon career scoring list. 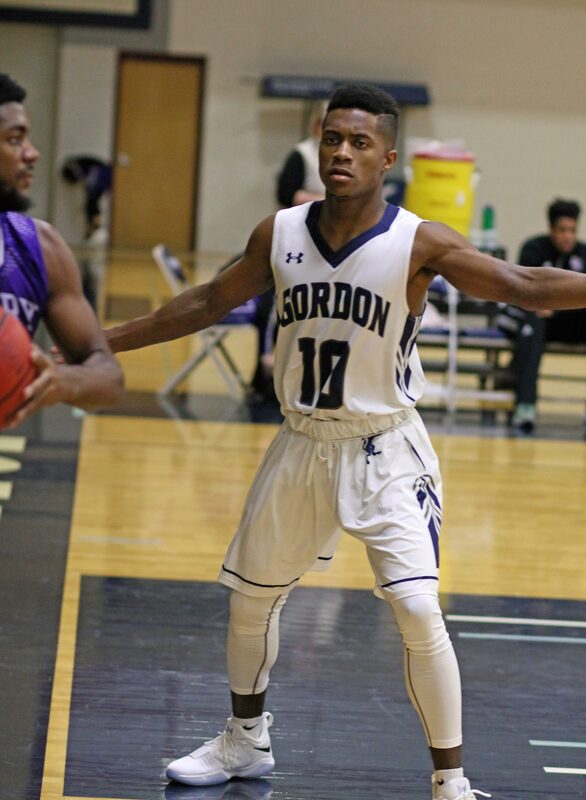 Last time Gordon played Curry at the Bennett Center, Garrisson reached 1000 points. Today was my first in-person look at the team as the pictures will show. I expect, Lord willing, to attend the three upcoming home games. Social News: Jason Dempsey and Taylor McSherry are now engaged. Taylor was a terrific soccer player for the Scots. She is an assistant soccer coach at Bentley. (Amesbury MA) The Scots did not fall into the trap of taking Curry lightly. The Colonels (1-16) led very briefly in the first half and then slid to a twelve-point deficit (37-25) at the half. 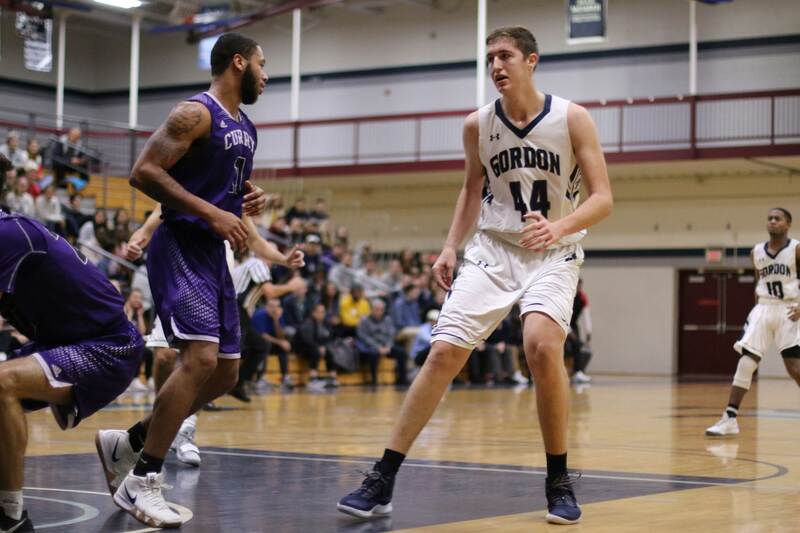 After Gordon (11-6) scored the first eleven points of the second half, the game headed toward the assumed outcome. Credit the Colonels for persistence. Lhereif Kenku canned twenty for them in the second half to hold down the final Gordon margin. Curry joined the ranks of teams unable to shut down Garrisson Duvivier. 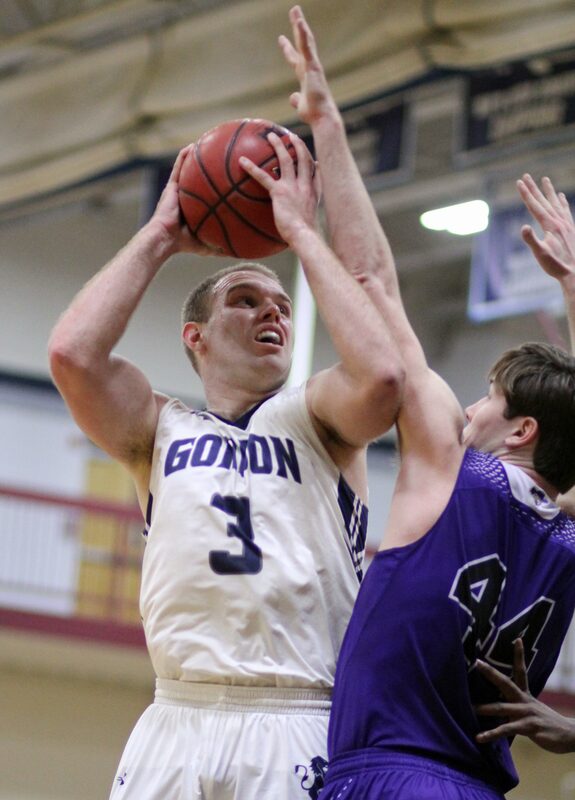 GD already had a double/double by halftime and finished with sixteen points and a career-high twenty rebounds. According to the Gordon website Garrisson is now 12th on the all-time scoring list. My unofficial records have him in 11th with 1212 points. I’ll need help getting that straight. The Scots have now played three road games in the last five days. 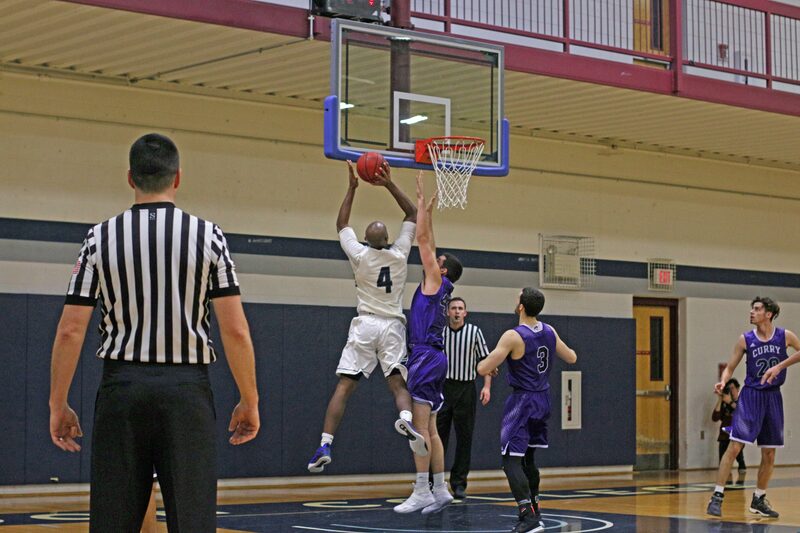 The big win at Roger Williams was offset by the loss Thursday night at Western New England. 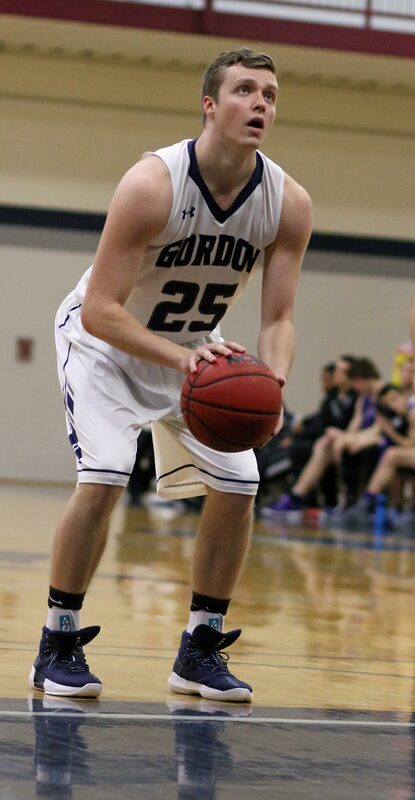 The win today at Curry gets Gordon set up for four straight home games. How crucial are these home games? Very! Three of them are against teams (UNE, Nichols, Western New England) that have wins over GC. A little revenge? 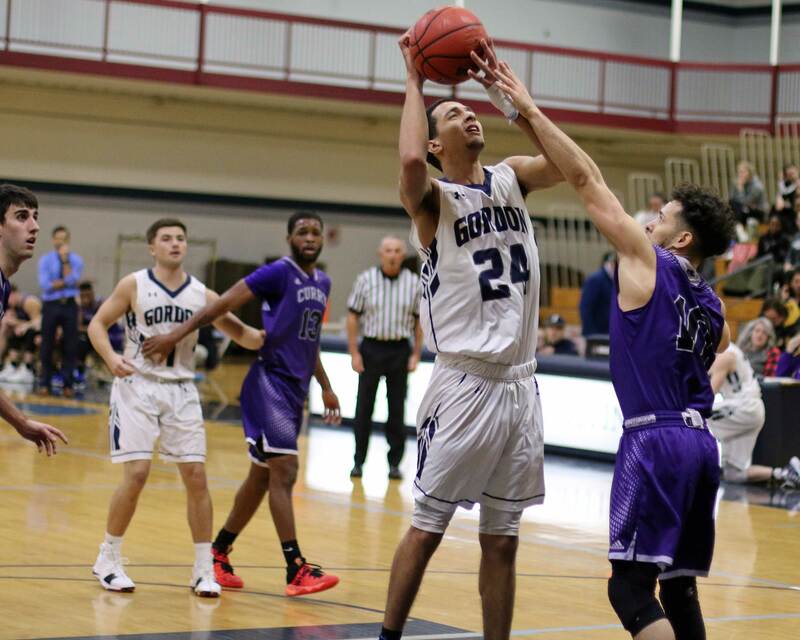 The other home game is against Wentworth, the team currently tied for second place in the Commonwealth Coast Conference with Gordon. 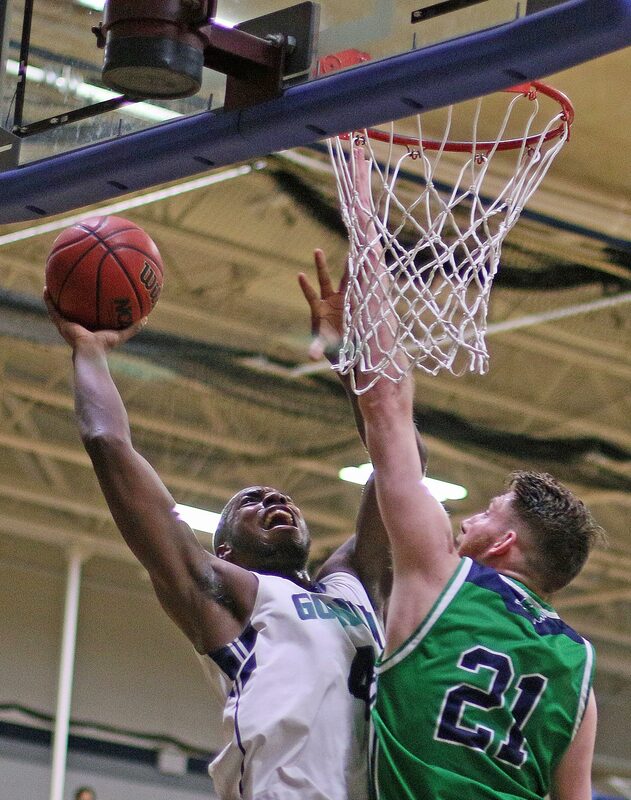 UNE defeated Endicott this afternoon in Biddeford (ME), dropping the Gulls into second play, so they will be a big challenge Wednesday night in the EARLY game (5:30). 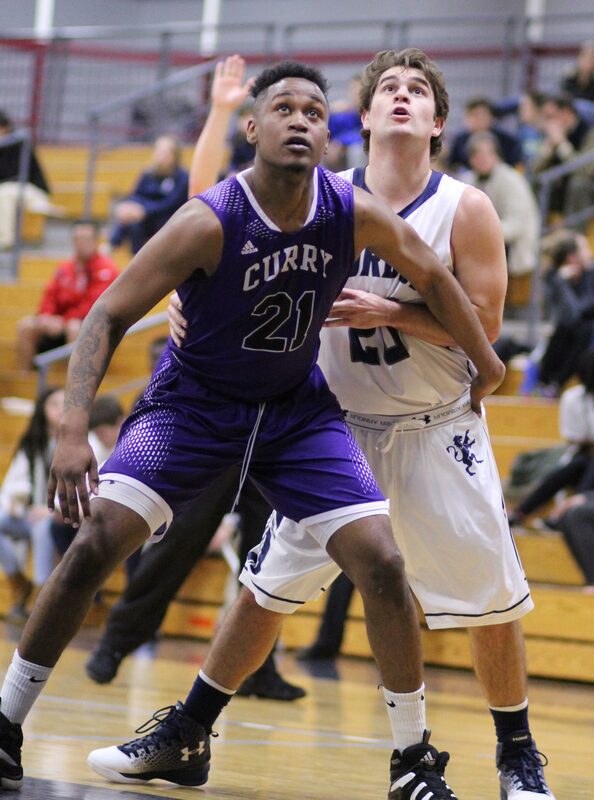 Both Lheriet Kenku and teammate Kieran Carroll (20 points) put up good numbers for Curry. The issue, for Curry, was the unproductive rest of the team. Take away Lheriet and Kieran’s 17-for-32 overall field goal shooting and the rest of the team was a very low 8-for-38. The Colonels have now lost fifteen straight this season. Their stretch of losses in the CCC now reaches forty-five and counting. 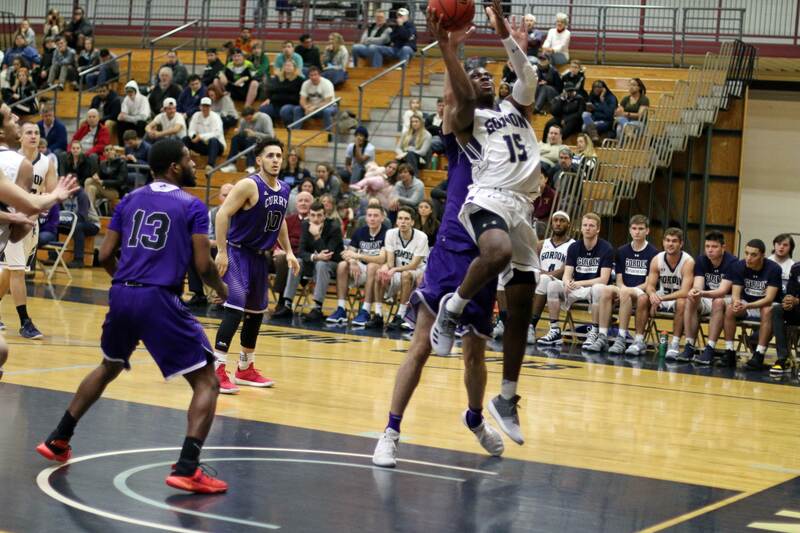 Their last win was in February of 2015 against Salve Regina. Eric Demers found enough open space to reach twenty-two points. He also took in six rebounds. The Scots have won nine of their last eleven games. Avelino Damoura made his debut last game. 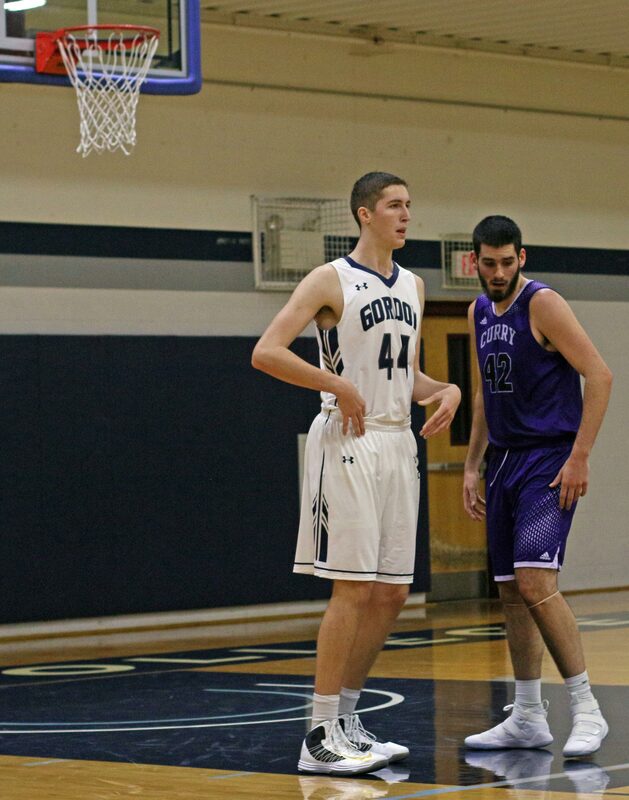 In game he cashed a three to earn his first GC points. 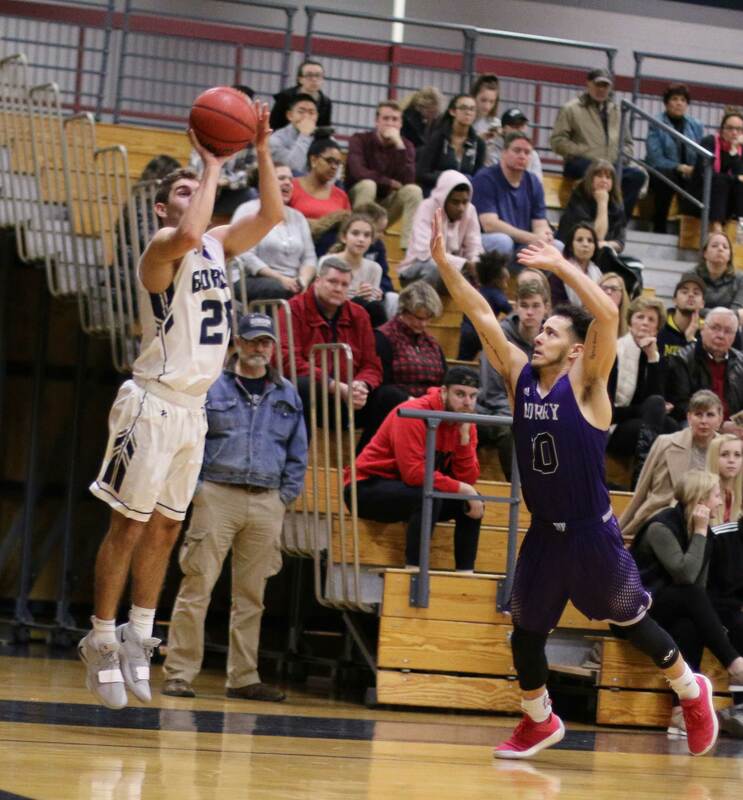 (Wenham MA) Junior Garrisson Duvivier crossed the 1000-point threshold in an easy, 86-66, win over Curry on Tuesday night at the Bennett Center. A slam dunk did the trick tonight for the 6-6 player from Brockton in the first half in Gordon’s home opener. Curry (1-7) has now lost thirty-nine straight Commonwealth Coast Conference games dating back to February of 2015. I spoke to Curry’s assistant coach Lambros Papalambros at halftime. Lambros was Curry’s excellent playmaker back when the Colonels were winning CCC titles. He told me it was tough to watch the way things were going for Curry. “I would love to be out there playing,” he told me. The Colonels could have used him. The visitors from Milton (MA) hung in there for thirteen minutes of the first half (32-29) but then the wheels came off. 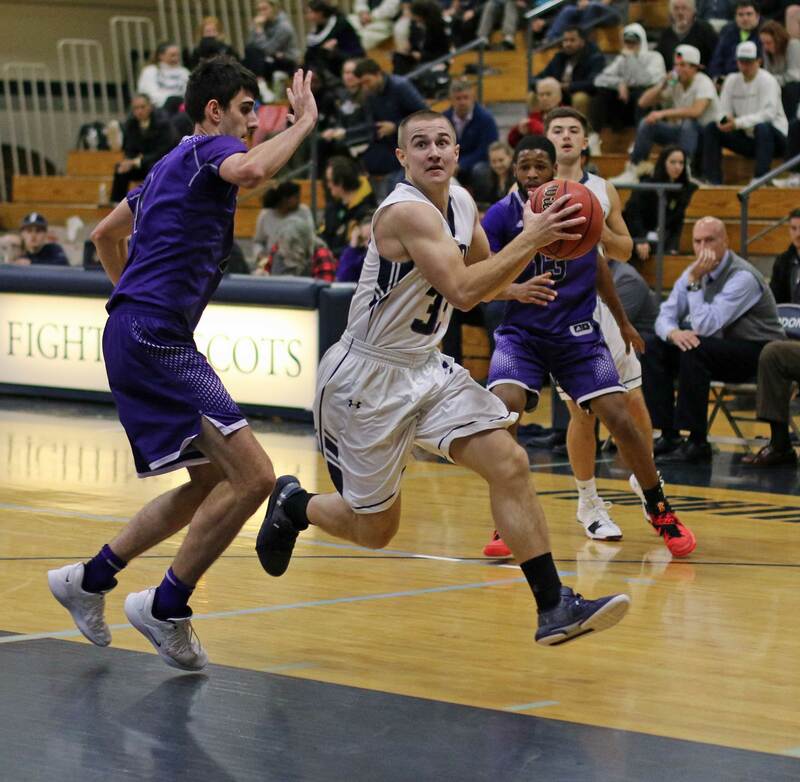 The Scots (2-3) tallied the next sixteen points over a 3 ½ minute span to escape to a 48-29 advantage. 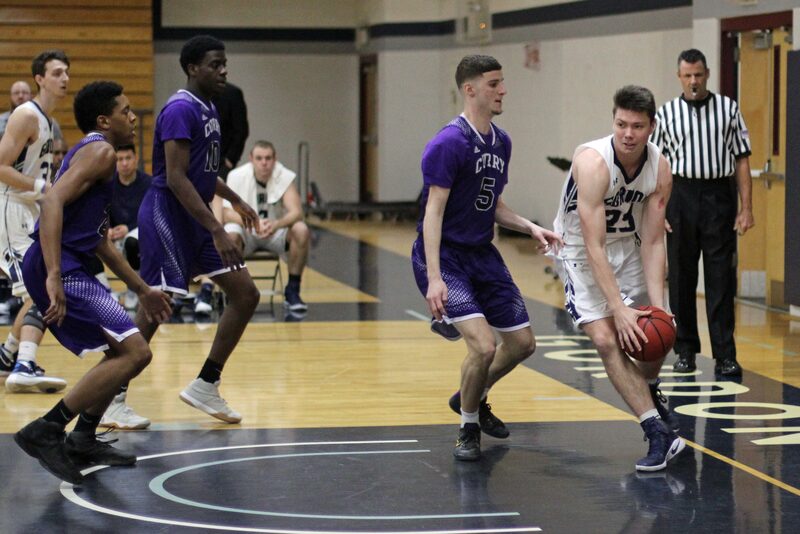 The offense during the breakaway stretch was provided by Eric Demers (two 3’s), Garrisson Duvivier (dunk), and Jake Haar (two 3’s and a jump shot). The key player in the segment? Jaren Yang. The senior point-guard handed out four assists. 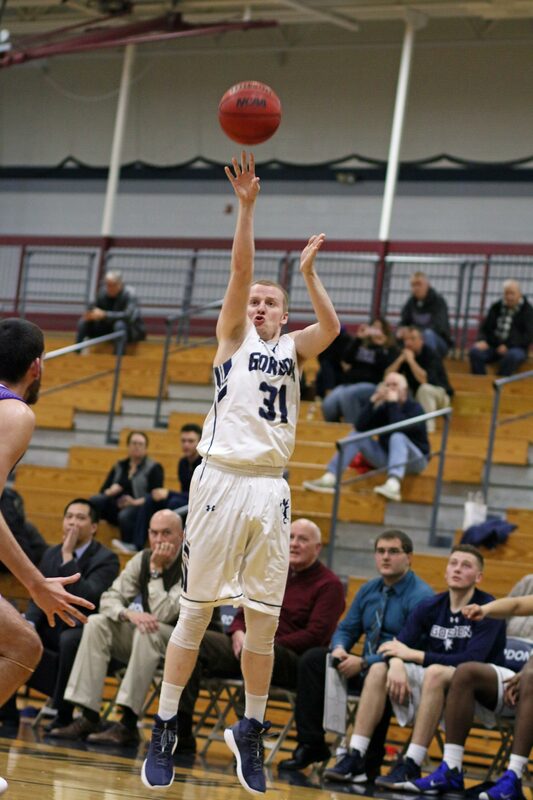 Jake Haar making three’s was a welcome sight for the GC faithful. After a 2-for-3 first game (Elms) Jake had struggled (by his standards) through a 4-for-14 stretch during Gordon’s recent three-game losing streak. Tonight he was 3-for-4. Welcome back, Jake! Curry got itself into trouble in the first half with 3 ½ minutes of scorelessness. Another dry stretch showed up for Curry to start the second half. 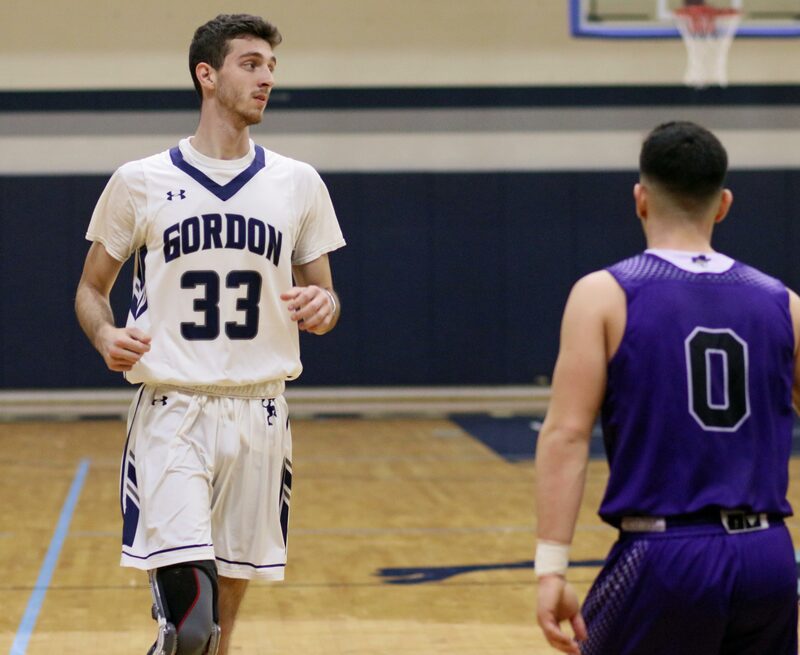 It took them 6 ½ minutes to get points on the board and the GC lead bulged to 64-33 with over thirteen minutes left. That large lead enabled the Bennett Center crowd to get a look at Gordon’s entire roster. It also enabled me to get pictures of the newcomers. 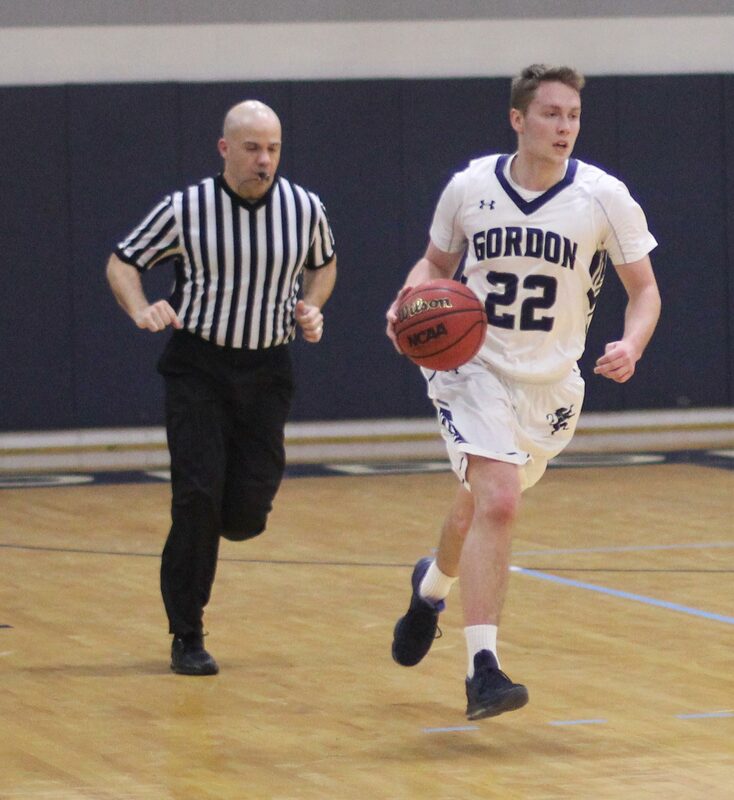 Eric Demers paced Gordon (2-3) with twenty-two points and four steals. Eric has scored 20+ points in three straight games. His ability to create space for shots and make a bunch of them has been notable recently. Eric is a warm 14-for-27 from long range over the last three games. Shooting like that should draw more defenders and open up better looks for his teammates in the future. Jaren Yang had nine assists tonight. That matches his career high. 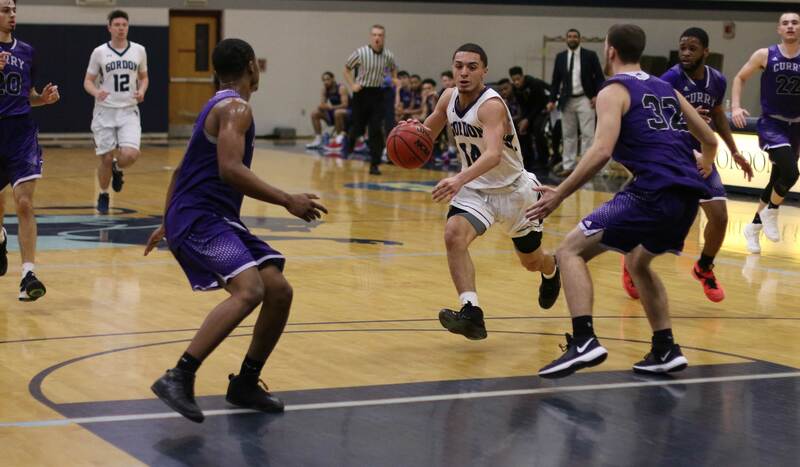 His other nine-assist game was versus Endicott last season. Three Scots from the past (Greg Walker, Richie Armand, and Jason Dempsey) were in the house. Richie has a job with the Patriots. Gordon gets non-league Becker on Saturday afternoon. 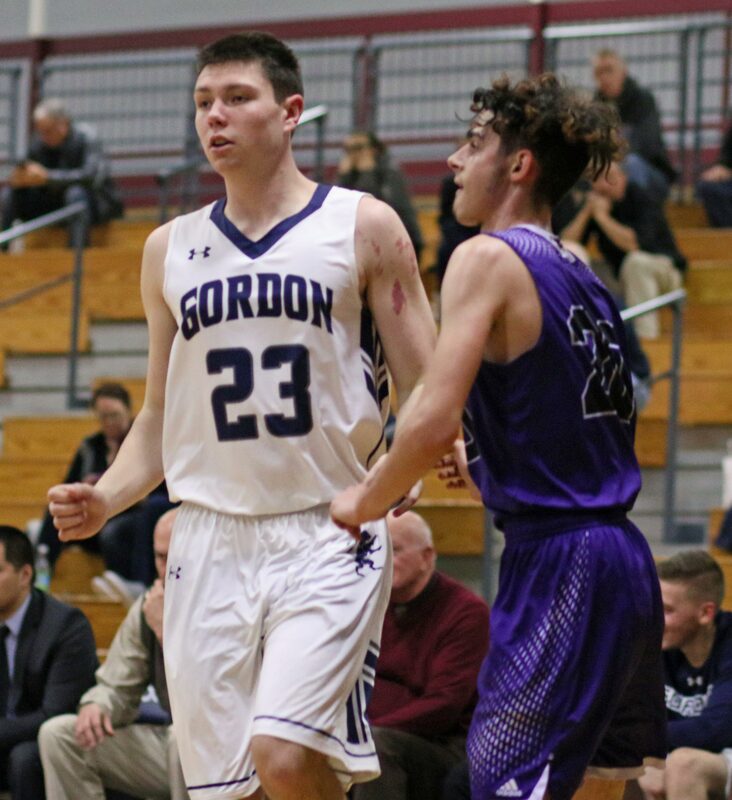 Curry and Gordon both had wins over Elms this season. (Wenham MA) It was a scoring drought of epic proportions. 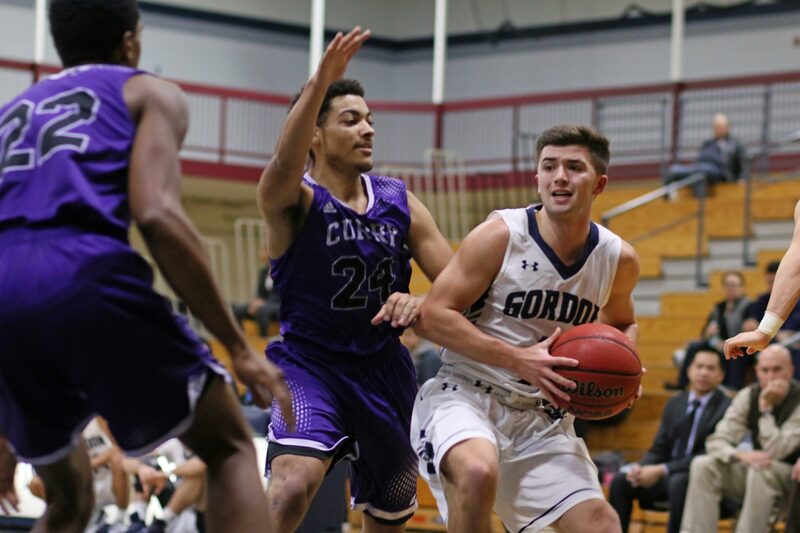 Gordon (12-8) broke away from a competitive game with Curry (1-19) in the second half during that drought and rolled to a, 88-69, win on Tuesday night in Commonwealth Coast Conference action. The Colonels’ offense was shut down entirely for six minutes in the second half and Scots put twenty-one unanswered points together. 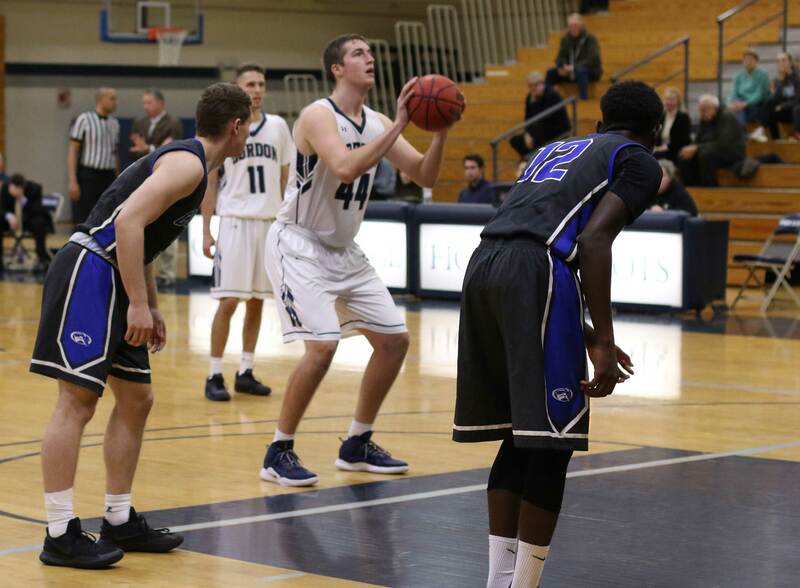 That run turned a GC 64-52 lead into an 85-52 rout with 5 ½ minutes left. Great time for the reserves for both squads the rest of the way. Garrisson Duvivier had his best statistical game of this season on short minutes (21). The productive sophomore registered a career high in blocks (six) including two in the last minute of the first half. Both Garrisson and Sam Johnson turned in double/doubles in this one. Gordon had serious trouble with Curry in December, trailing by as many as fifteen in the second quarter. 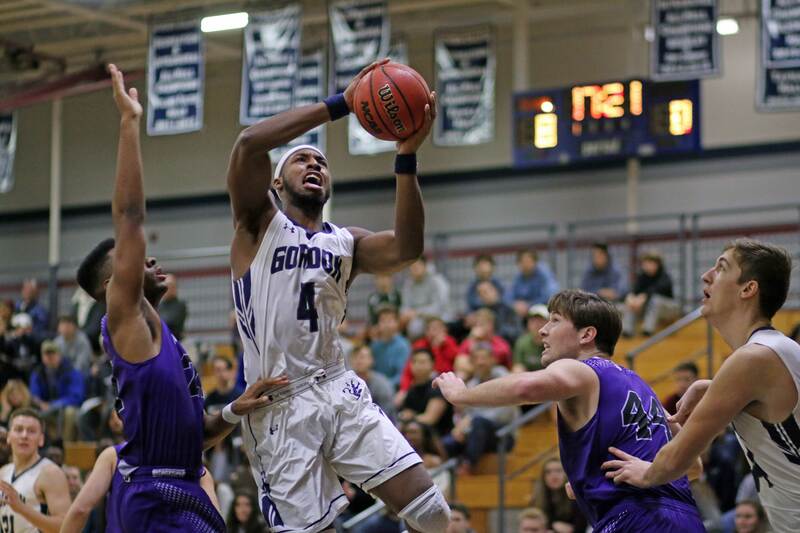 No such lead the second time around but the visitors were tied with GC, 47-47, five minutes into the second half. 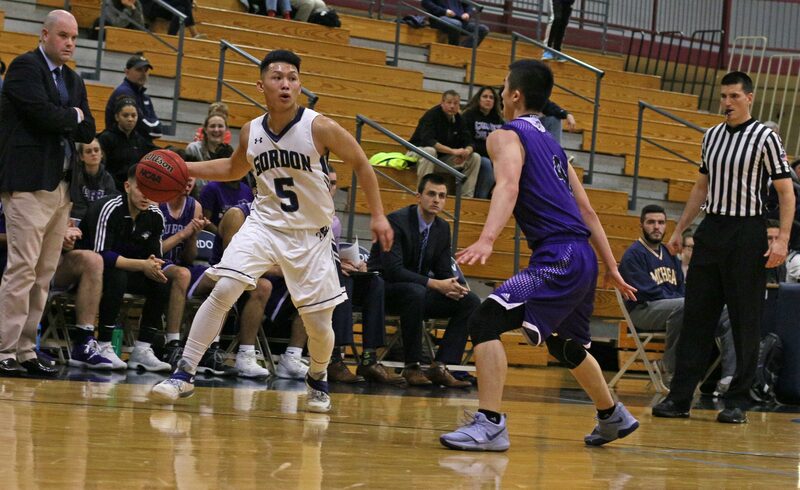 Two free throws by Garrisson, an old-fashioned 3-point play by Sam Johnson, and layups by Jaren Yang and Sam fashioned a 9-point run and Gordon gained separation, 56-47. A couple of minutes later the disastrous scoring drought kicked in for Curry. The Colonels misfired twelve straight times and had several turnovers added in. 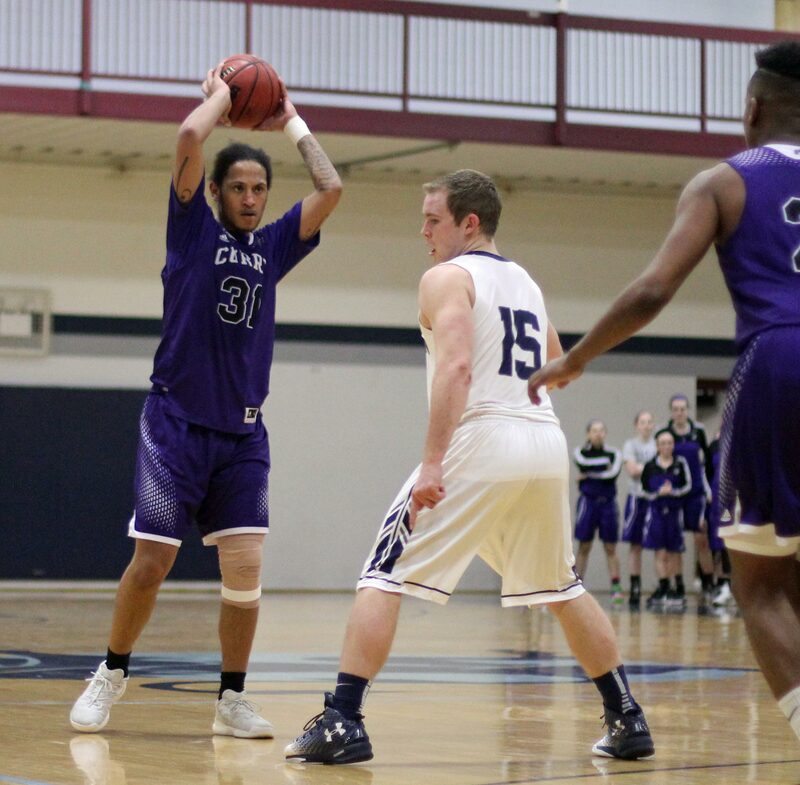 That was no way to break a thirty game CCC losing streak. Curry was missing its top two scorers and its best rebounder. 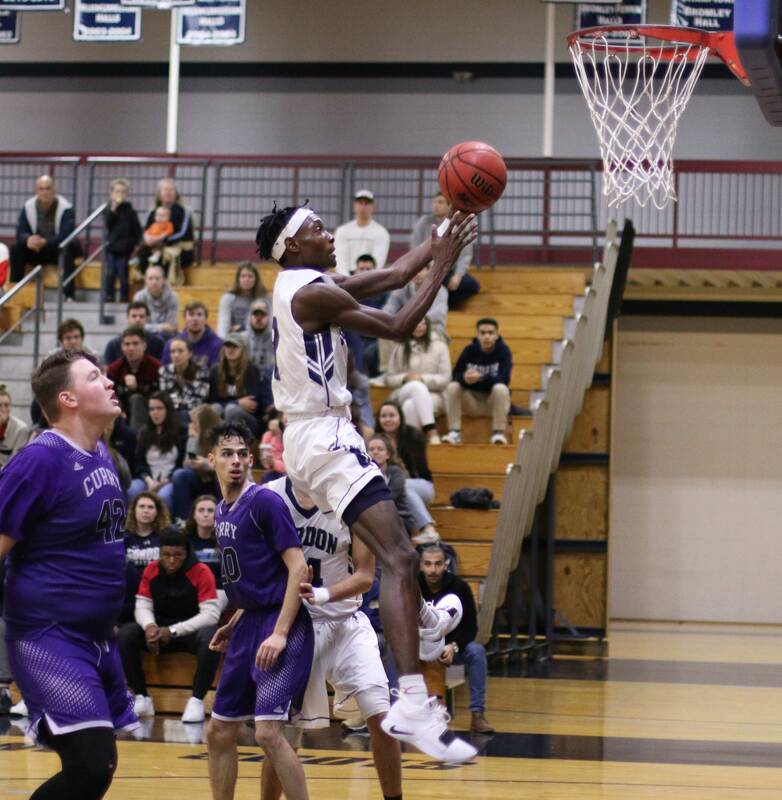 Jared Johnson led CC with twenty points. Kiernan Carroll had a double/double for the Colonels. 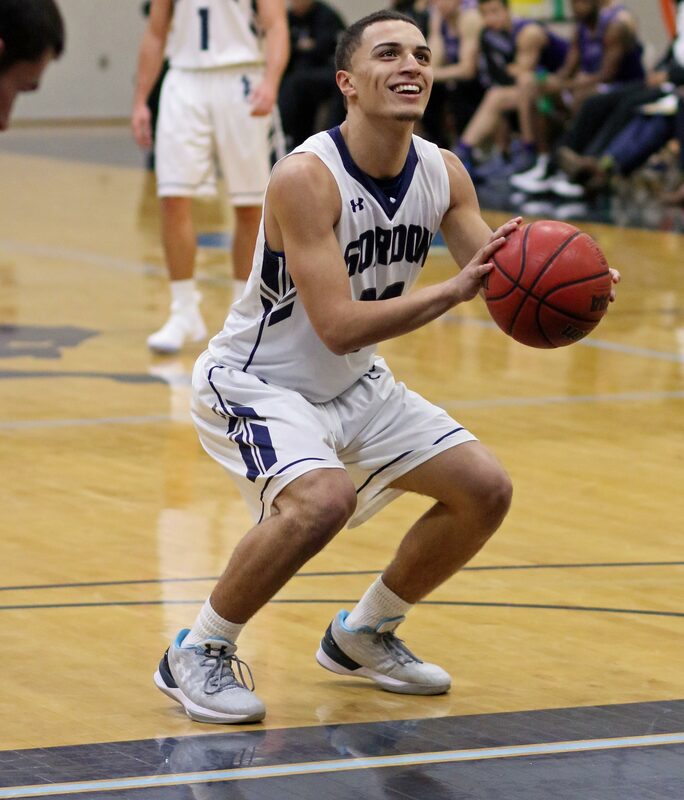 Josh Ribeiro hit career highs in points (eleven) and efficiency (14). 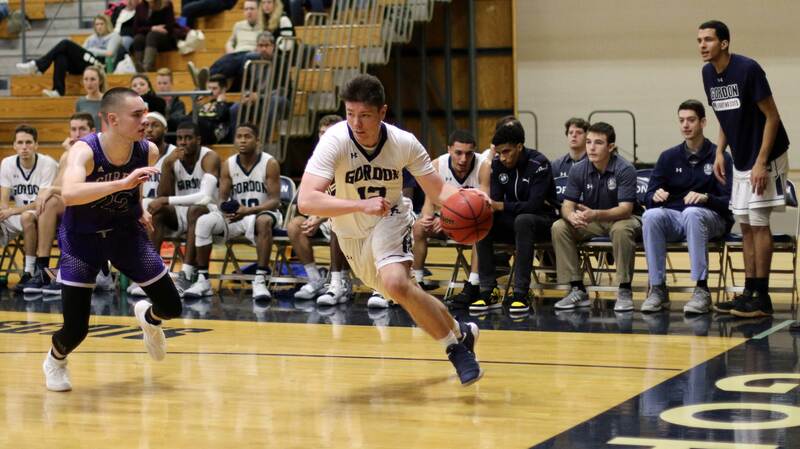 Jake Hart had another solid game for GC with eleven points and five assists. 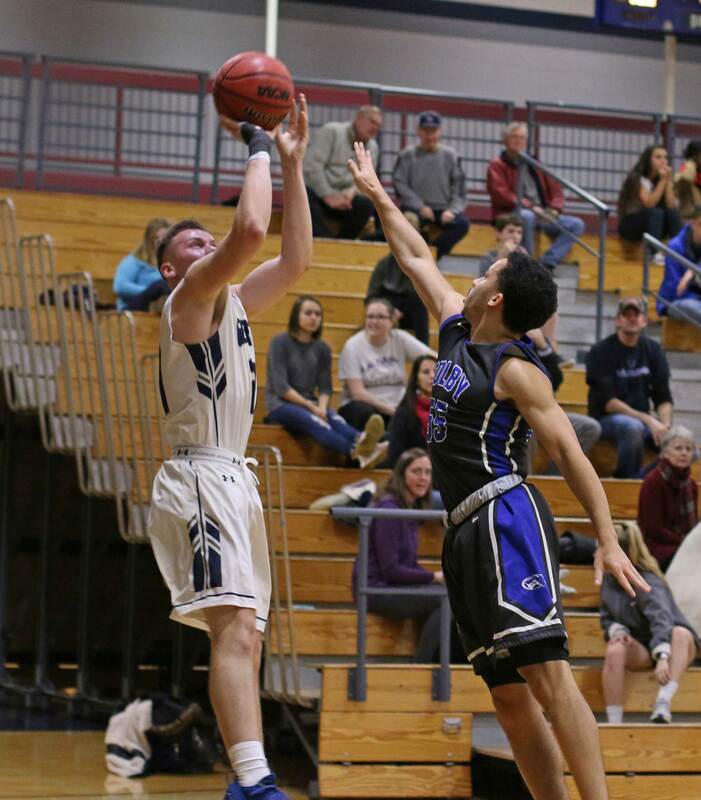 Curry lost to Salve Regina by a point earlier this season. 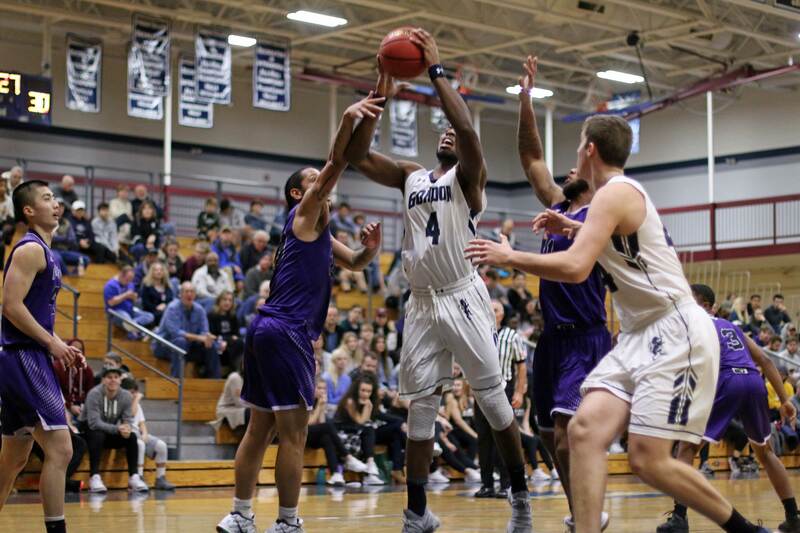 Their last league win was on February 21, 2015 against Salve. The only downer in this game for the home team was an elbow injury to Noah Szilagyi. No way to know the severity of it at this point. Next game is with our Beverly neighbors on Saturday at 3PM. 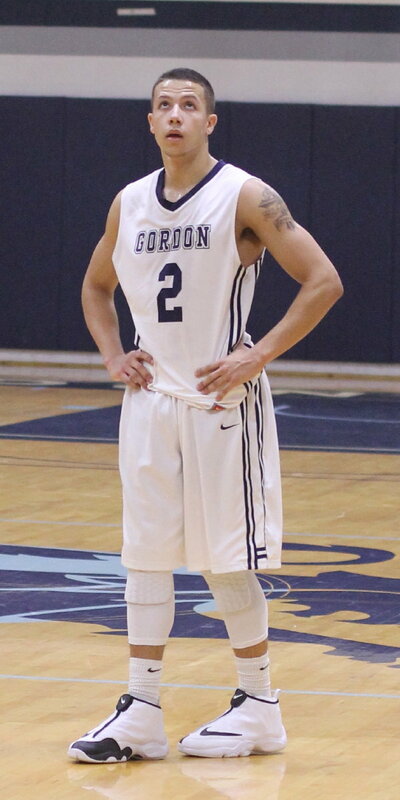 Sam Johnson (Gordon’s only senior) will be recognized. The Gulls are 16-4 and have won four straight. Last time the Scots trailed by one and had the ball with a chance to win the game. Didn’t get it done that time. Saturday would be an excellent time to upset the CCC’s top team. (Amesbury MA) One of the better Gordon comebacks. 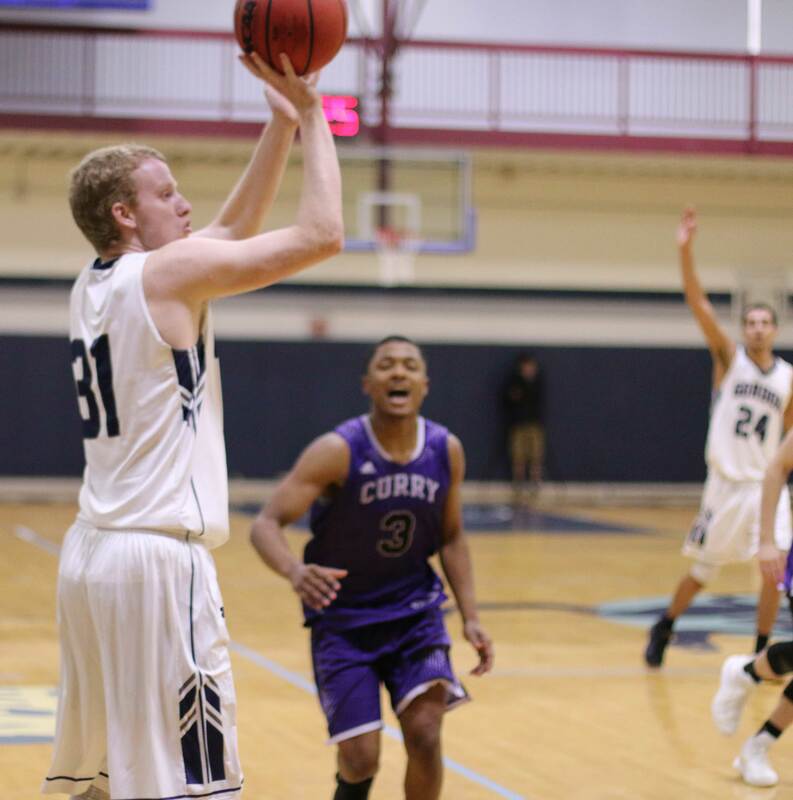 The Scots (5-2) needed every ounce of comeback after fumbling their way through the first twenty-eight minutes versus Curry (0-7). 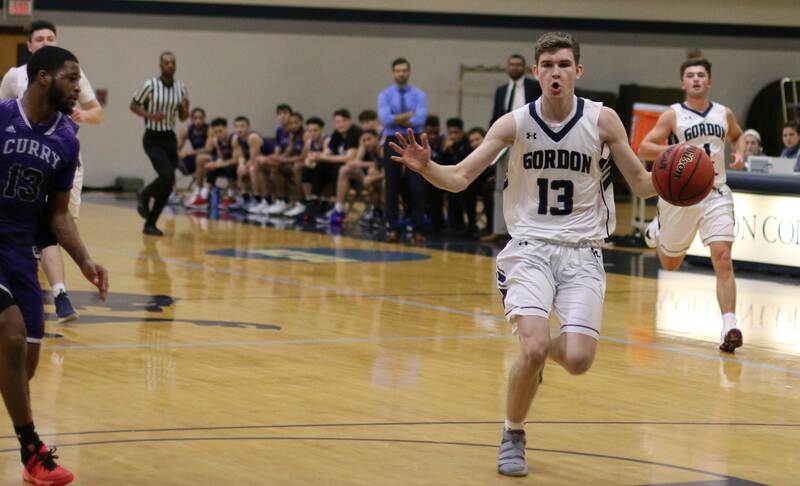 The satisfying end result was a 76-71 win in Milton on Tuesday night but from what I saw of the Live Stats and the shaky video, Gordon was verrry fortunate to take this one. The Scots trailed by fifteen (58-43) with 11:50 left and it was nearly time to change the channel to something more pleasant such as the Chris Sale trade. What was wrong with the Scots? Turnovers. Those unwanted “pastries” reached fifteen (!) in the first half and eight different Scots contributed. This was not a case in which Coach Murphy could pull out a player and the problem would be solved. This was team wide. Fortunately, there was a second half. After eight minutes of that 2nd half Curry, however, was still making shots and looked ready, after thirty-one straight losses, to win a game. 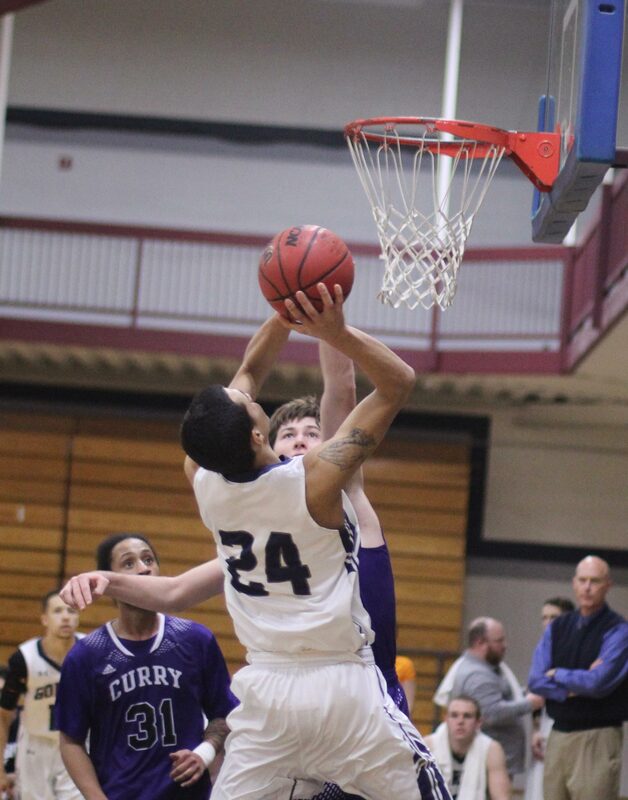 The rest of the way we saw the Curry team that trailed Roger Williams, 55-20, after one half. Poor shooting combined with tiring defense did in the Colonels. 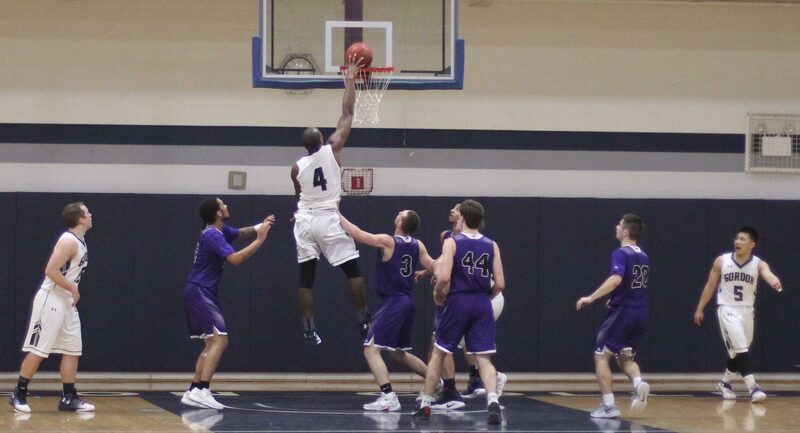 The Scots “won” the last 11:50, 33-13, and that was enough to win their third straight. The same group that struggled in the first twenty-eight, took better care of the ball (only 5 turnovers in the 2nd half), and found points in bunches long-range and in close. 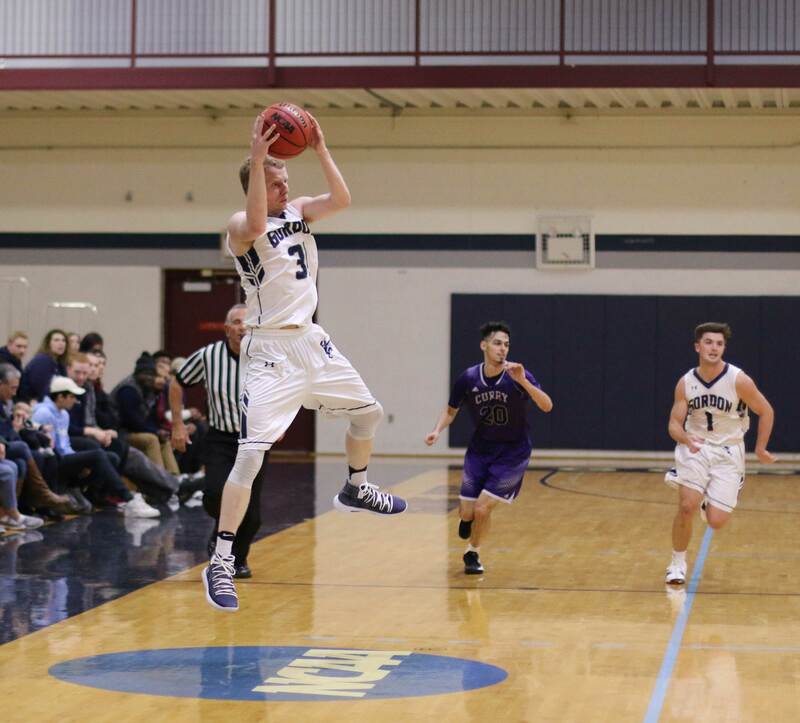 The Scots dissolved that 15-point lead (58-43) with a run of eleven unanswered points. 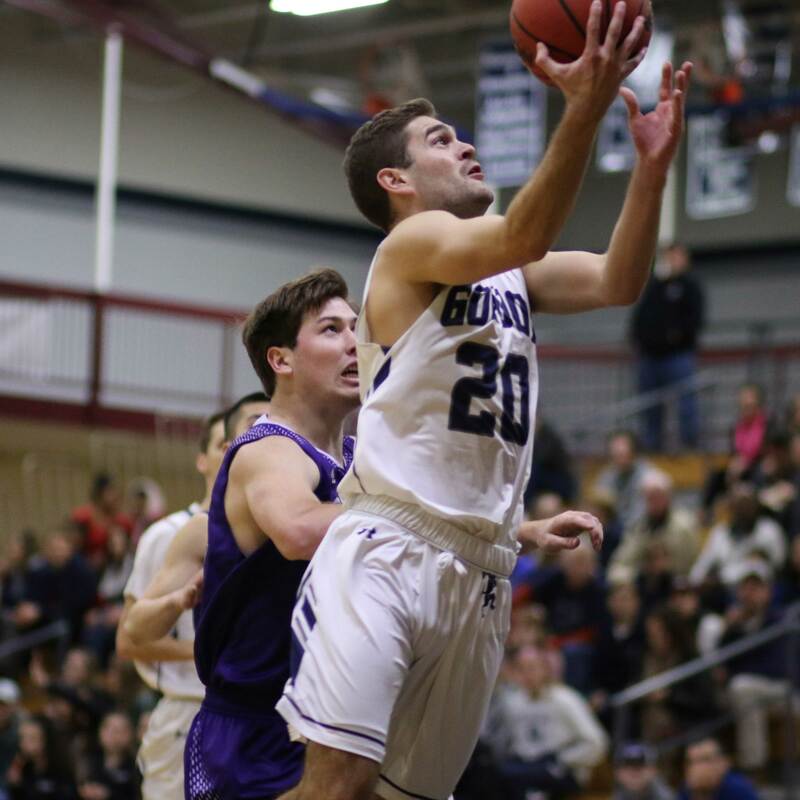 Layups by Eric Demers and Garrisson Duvivier combined with three’s from Noah Szilagyi, Dylan Marshall, and Eric Demers set the comeback in motion. Credit Curry. 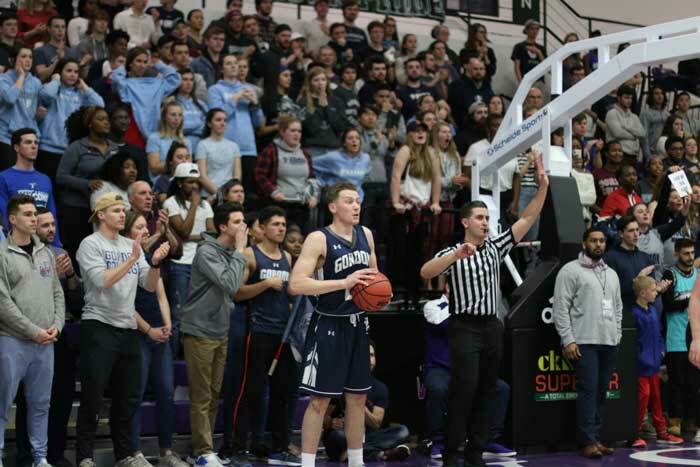 The Scots were within two (58-56) but the home team was still ahead 71-66 with 1:45 to go. Make any kind of shots thereafter and the streak is history but on this frustrating night Curry was unable to get another point. 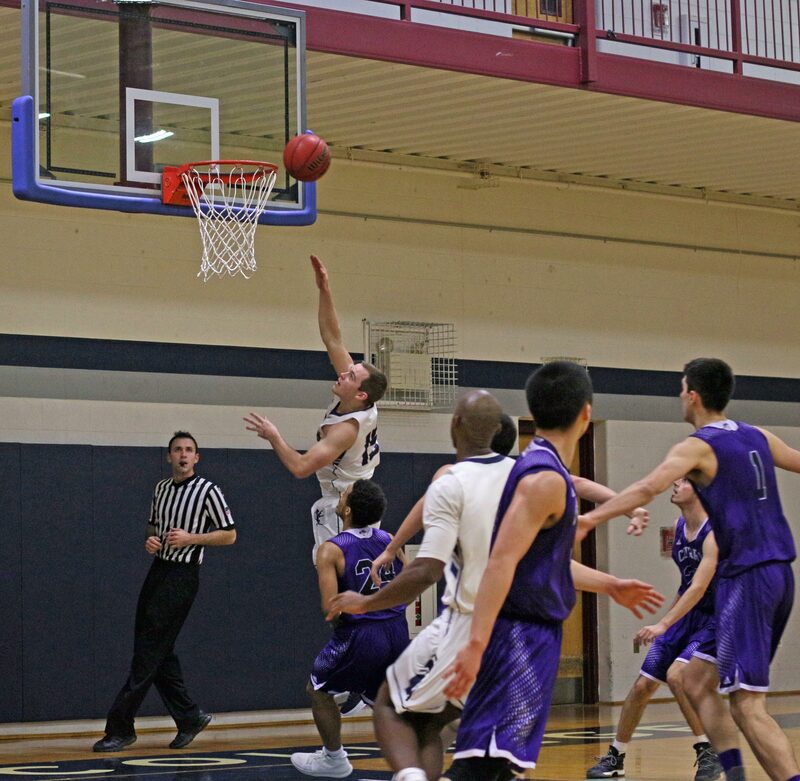 A Jaren Yang steal led to two Eric Demers free throws that tied the score. 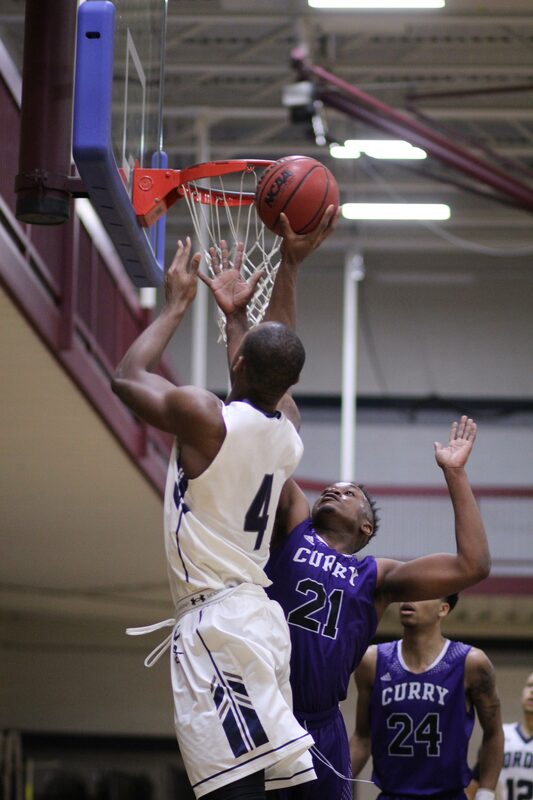 Garrisson Duvivier put the Scots in front by two after Curry missed two shots. Another CC miss and Sam Johnson was fouled after getting his 19th rebound. Sam made the first but missed the second, however Garrisson grabbed the rebound and GC had another possession with a 3-point lead. Jaren sealed this one with two free throws. The Efficiency stats confirmed the closeness of this game as the Scots only edged Curry, 81-78. 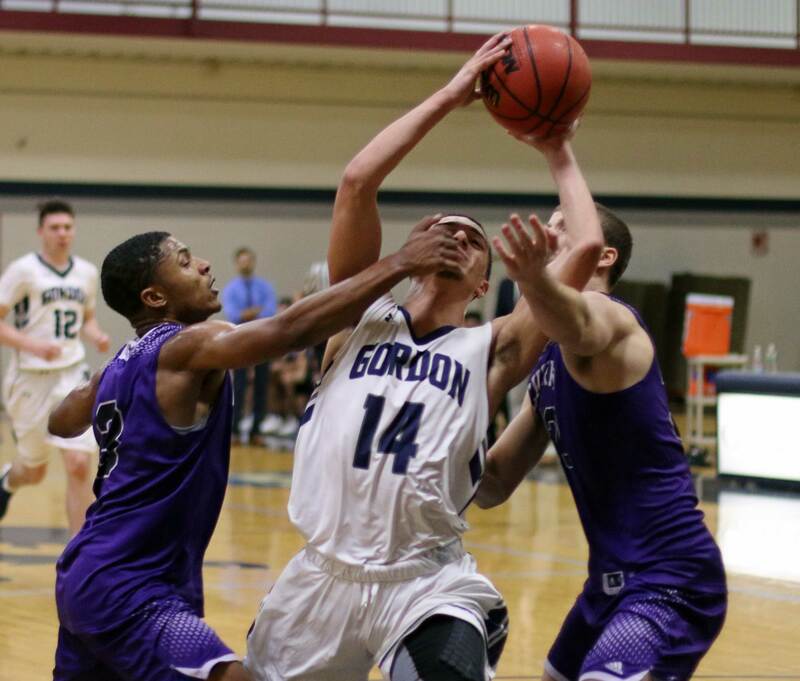 Next game for Gordon is Thursday night (5:30 PM) at Worcester State. Let’s hope that GC takes better care of the ball in that one. Sam Johnson’s run of double/doubles reached nine. 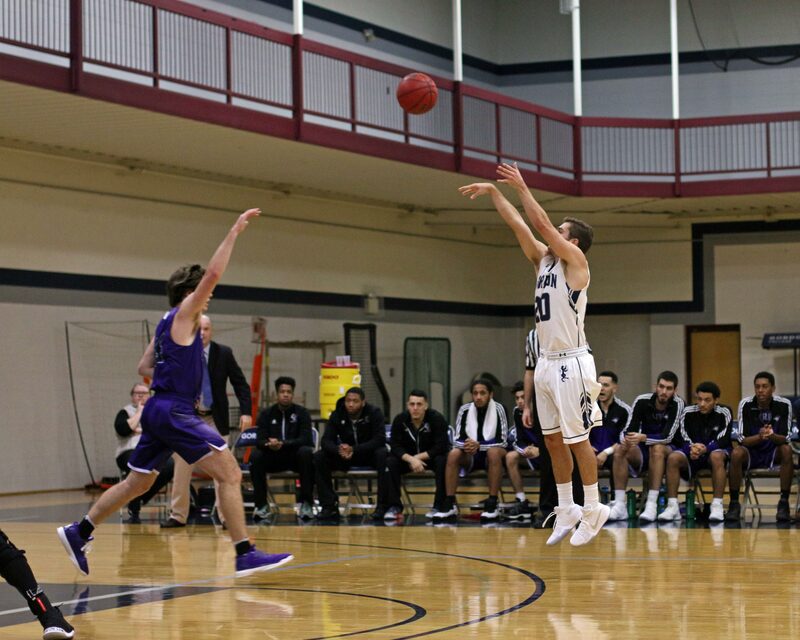 Eric Demers is shooting 50% after two games and averaging twenty-two points. Dylan Marshall collected his first three of the season and it was part of the Scots comeback run in the second half. Teams can live by the 3’s and die by the 3’s. Curry was 5-for-25 from long range. 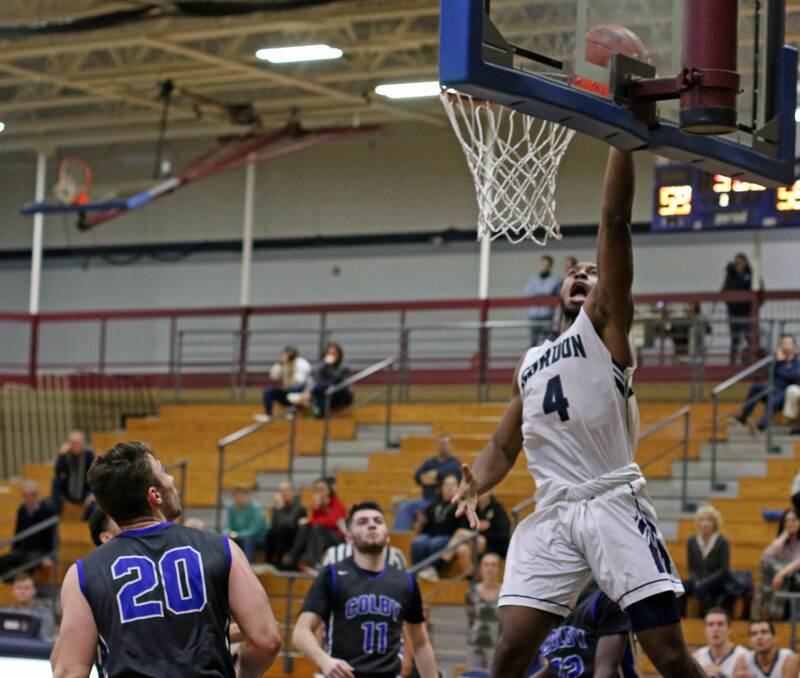 (Amesbury/Milton MA) It wasn’t unexpected but it was necessary to earn the Scots a fifth place finish in the Commonwealth Coast Conference. 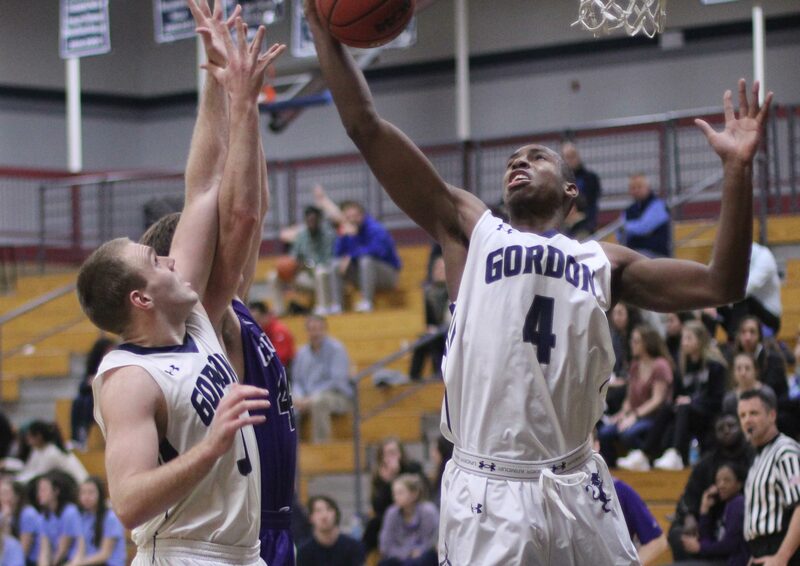 Gordon (12-13) defeated winless Curry, 88-72, to close out the regular season schedule. 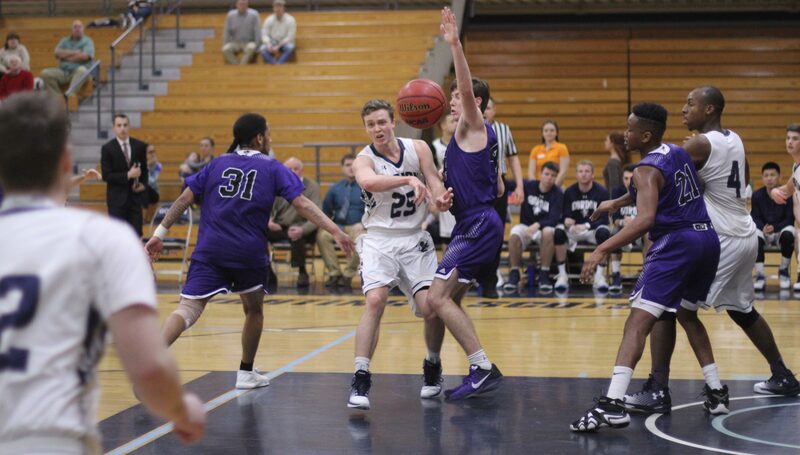 The win separated the Scots from Roger Williams, which lost to Wentworth, and secured 5th for the team from Wenham. 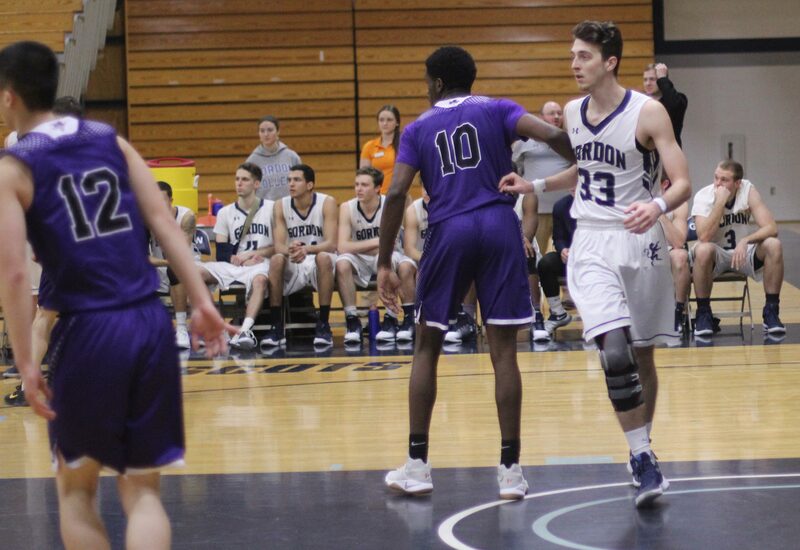 Roger Williams held the tie-breaker against Gordon. Curry (0-25) has had season-long struggles at both ends of the court. That pattern continued today as the Scots had plenty of good looks and the Colonels trailed by twenty, 49-29, at the half. Things didn’t change much in the second half although the GC personnel certainly did. The starters minutes were less than usual as everyone in a Gordon uniform saw action. 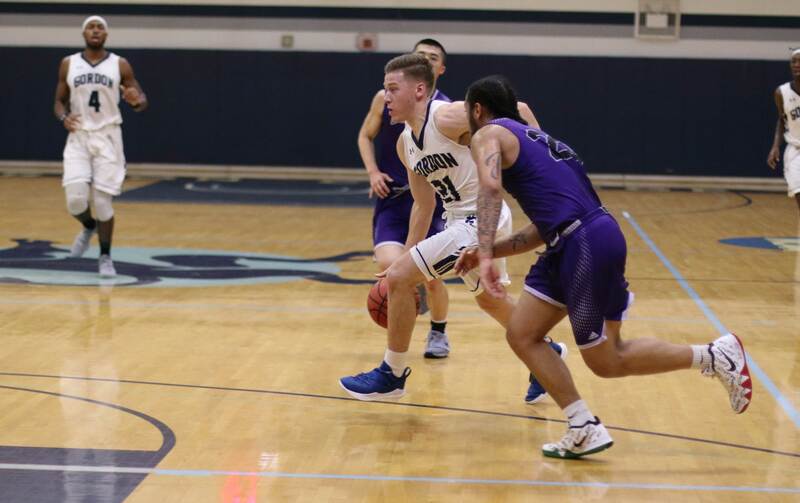 The Curry roster included only nine players and one of them was their lone senior, Tim Flanagan, who collected twenty-six points while playing the entire game. 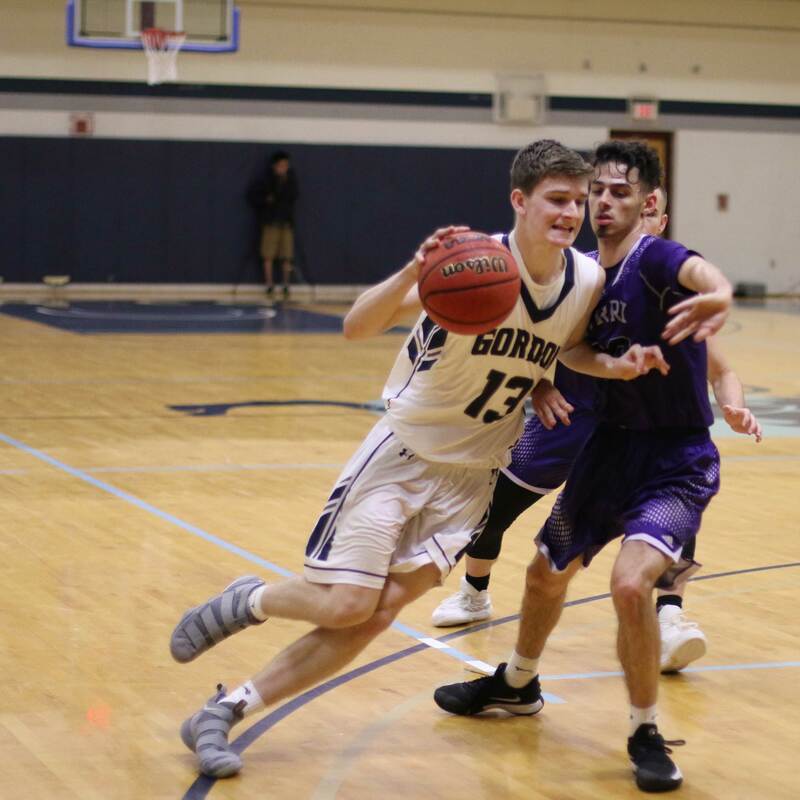 If you’ve taken the time to read this far you may wonder, or already know, about Tuesday’s opponent in the opening round of the CCC tournament. It’s our “friends” down the street in Beverly. 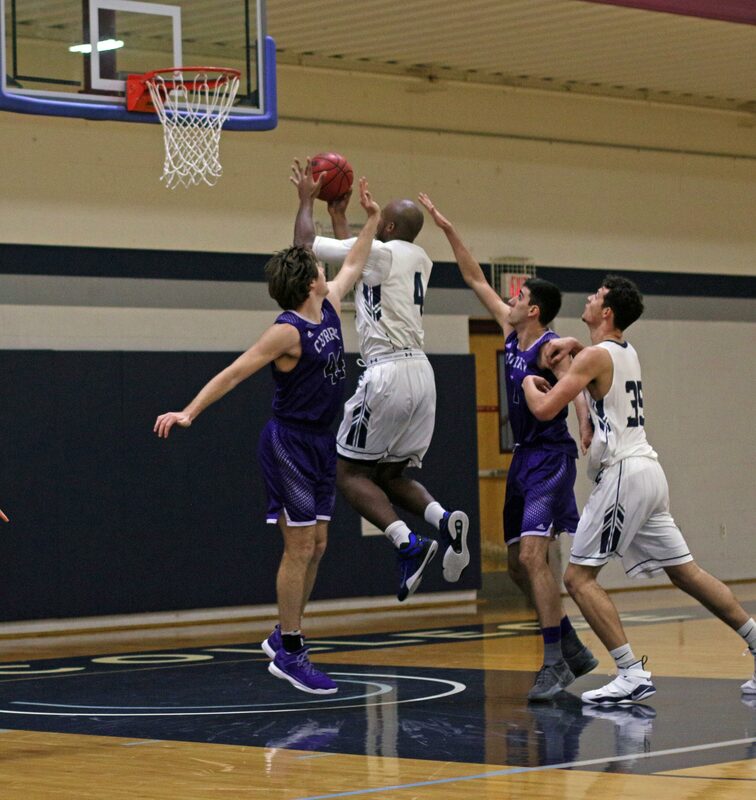 Yes, a third try against the Endicott Gulls. Game time is at 5:30PM on Tuesday. Why so early? The EC girls’ basketball team is also opening at home in the tournament. When I realized that it was Endicott again I looked back at my coverage of those two losses (75-60 and 80-73) to the Gulls. Similar patterns emerged in both games: good first half and weak second half. 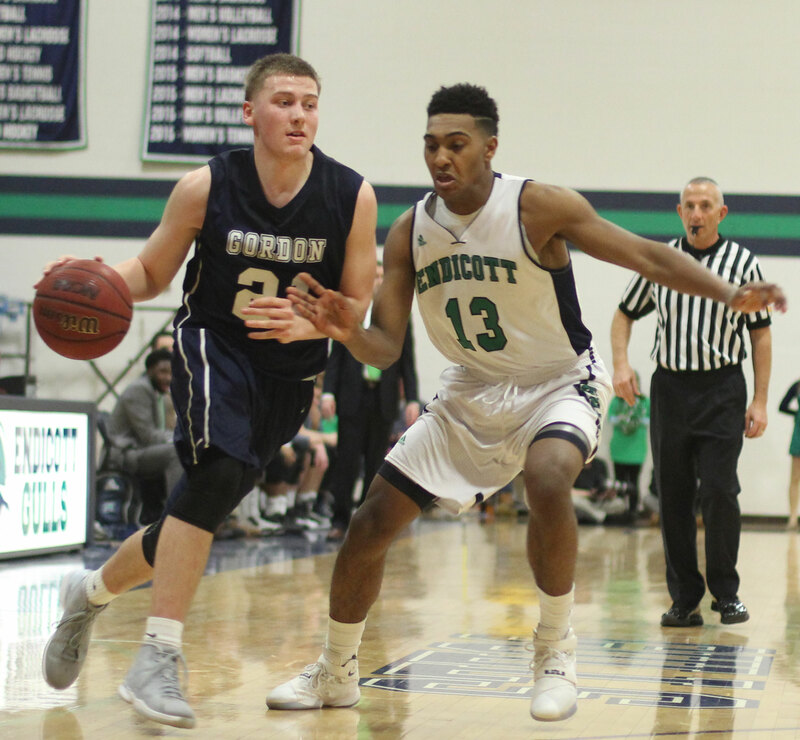 Endicott pulled away in each second half because the Scots’ offense hit dry spells and Endicott’s didn’t. The last meeting (a week ago) was particularly tough because in a 7-point loss the Scots missed ten of eleven 3-point attempts in the second half. In the first loss, Gordon points from the inside vanished in the second half. Either one of those deficiencies will spell trouble on Tuesday night. However, if the outside shooting is consistent then things will open up inside. If the inside game is productive there will be openings on the perimeter. 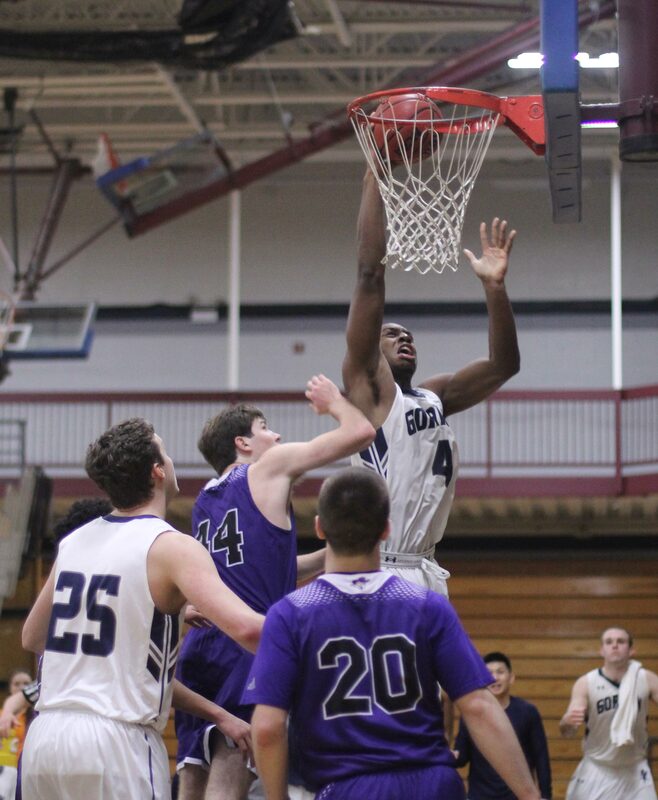 Can the Scots bring that sort of game to Beverly on Tuesday night? I believe that they can. If they can stay close the pressure builds up on the home team down the stretch and then anything can happen. We can certainly look at this year’s GC men’s soccer team for inspiration. They ended up playing the #1 seed Gulls at Beverly in the CCC championship game and brought the league trophy to Wenham with an exciting win. 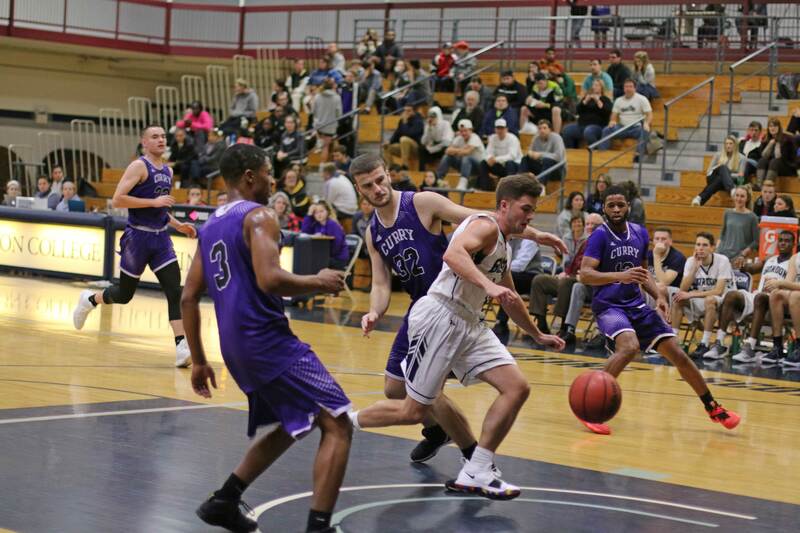 I have always believed that any win over Endicott is special. It’s like a Red Sox/Yankee thing to me. To win on their court in a tournament game would be extra special. I would expect that there will be plenty of GC support on hand come Tuesday night.